Last month we saw the biggest changes to the best $700 gaming pc build and this month the build stands strong. For February 2019 the CPU powering this rig is the Ryzen 5 2600 CPU, and a very capable RTX 580 graphics card, making this a very powerful $700 / budget 1080p resolution pc build. 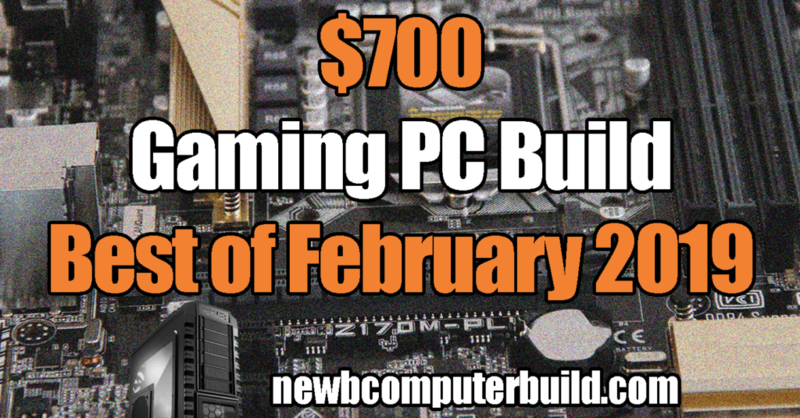 February 2019 Updates: The $700 gaming pc build had a significant upgrade last month with the inclusion of a more powerful CPU (Ryzen 5 2600) and a more powerful graphics card (RTX 2060). This build could probably fufil most standard gaming pc builders out there who simply want to game at high settings at 1080p. The CPU for February 2019 is the Ryzen 5 2600 CPU is a superb value coming in with 6 CPU cores and 12 threads at 3.4Ghz. This is a solid gaming cpu that is priced really well. The graphics card gets a major bump this month with the RTX 580 8GB (specifically the Sapphire Pulse RTX 580). This card has so much potential when gaming at 1080p, and you should expect to max out most games at 1080p resolutions. Finally, for the PC case in the $700 gaming pc build — we have the Fractal Focus G. This case is a sophisticated, elegant case that provides a compact, smart layout for your pc hardware. The above are upgrades to the February 2019 $700 gaming pc build. That is if you have more to spend than a $700 budget for this gaming pc build, these are some options for you to increase your overall gaming performance. There are some significant upgrades above including the CPU and graphics card – and even further, if you upgrade the CPU you could also upgrade the motherboard for an even more overclocking capability for even more of a performance boost for nothing. The CPU upgrade suggested is an AMD Ryzen 5 2600X, this could be a slight upgrade in computing power and it overclocks quite nicely (in order to do so, please also upgrade the motherboard). The motherboard upgrade suggestion is an AMD socketed X470 board — the MSI X470GPLUS Performance GAMING motherboard. This motherboard can further leverage the included Ryzen cpu by providing an easier overclocking experience. If you are looking the simplest performance upgrade, then you could consider upgrading the graphics card to an RTX 2060 graphics card, which is a fantastic card and is also included in our February 2019 $1000 gaming pc build.